Walton High School is a public, four-year, comprehensive high school with a strong college-preparatory program. It is located in eastern Cobb County, a suburban middle-class residential community within the greater metropolitan Atlanta area. It is two miles north of GA Highway 120 and Johnson Ferry Road. As a comprehensive high school, Walton endeavors to meet the educational needs and expectations of all students. A broad range of courses and programs is available from a variety of Advanced placement and accelerated courses to cooperative education programs where students receive high school credit for supervised, on-the-job experience. A joint enrollment program with area universities and technical schools is available for seniors. In addition, electives are offered in Business Education, Applied Technology, English, Pre-Engineering, Mathematics, Foreign Language, Science, Social Studies, Fine Arts, and Physical Education. In 2011, Newsweek’s list ranked Walton 67th in the nation. 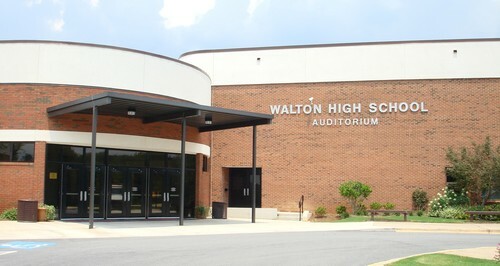 Walton is also the top ranked school in Georgia.